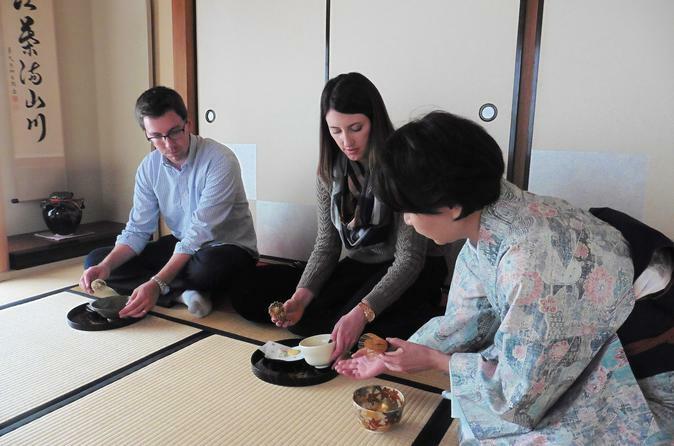 Gain an insight into Japan's traditional tea culture on this 2-hour experience. Admire the details of a tea ceremony and enjoy a bowl of matcha (green powder tea) and wagashi (Japanese sweets). Learn about the history and the culture of Japanese tea through tea ceremony in a casual setting then take a short walk to the nearby stores to find your favorite tea and sweets. The tearoom is down a narrow pathway surrounded by a bamboo fence, a rare space in Tokyo taking you back to the origins of the practice 600 years ago. The serene environment will bring you peacefulness as you savor a bowl of matcha green tea. At the designated time outside a specified train station, meet your interpreter who will then accompany you for a 5 minute walk to the tearoom. Tour through the world of tea in an authentic tea ceremony in the tea master's tearoom. Taste high quality matcha green tea with some sweet treats while learning about the utensils used. Walk from the tea ceremony classroom to a tea shop. Your first destination is a tea shop where the tea master selects a couple of varieties of green tea to serve you. Each tea has its own characteristics and should be served at an appropriate temperature. Enjoy the full experience of an authentic Japanese tea ceremony, paying close attention to the experienced host's elegant motion as he prepares the tea for you. Be amazed by the differences in the aromas and tastes of each green tea. Tea utensils, as well as packs of tea, are available for sale. Later, head out for a short walk along a charming pedestrian path. This is a popular area in the spring when cherry blossoms are in bloom. The last stop is a Japanese sweet shop, which has a wide selection of traditional and modern styles of Japanese sweets. Some of the sweets are fresh and should be consumed within a day or two while others can be stored longer, making for perfect gifts. Your tour concludes with a small gift of Japanese sweets. Your interpreter will see you off at Toritsu-daigaku station.